The diversity of cellular RNA structure and function has progressed from the early days of molecular biology, when we thought only about mRNA, tRNA and ribosomal RNAs. Then RNA splicing was discovered along with the many small nuclear RNAs that mediate that process. Next came small interfering RNAs and microRNAs and long noncoding RNAs, master regulators of cell processes. The latest addition to the RNA toolbox are circular RNAs (circRNA), first found in viroids, then cells, and now encoded in the genomes of two herpesviruses. Circular RNAs were first found to constitute the genetic information of viroids, unusual pathogens of plants that encode no protein. 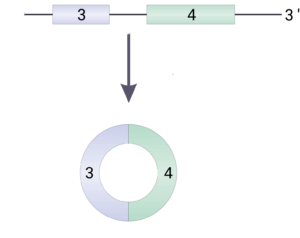 Later circular RNAs were found in uninfected cells, where they are produced by backsplicing: a downstream 5’-splice donor joins an upstream 3’-splice acceptor (illustrated). They have a number of diverse functions in cells, including acting as miRNA sponges, sequestering miRNAs so that they cannot degrade target mRNAs; regulating transcription, splicing, translation, and ribosomal RNA processing, and acting as adaptors for protein-protein interactions. They have been implicated in neuronal and cardiovascular diseases and cancer. Circular RNAs have recently been discovered in cells infected with two different DNA tumor viruses, Epstein-Barr virus (EBV) and Kaposi’s sarcoma herpesvirus (KSHV). These two herpesviruses account for about 2% of all human cancers, including lymphoid and non lymphoid malignancies (EBV), Kaposi’s sarcoma, primary effusion lymphoma, and multicentric Castleman’s disease (KSHV). Outbreaks of Kaposi’s sarcoma in the US in the early 1980s were the first signs of the emergence of a new immunosuppressive disease, AIDS, caused by HIV-1. circRNAs from several regions of the EBV genome were detected in infected cells and in post transplant lymphoproliferative disease, Burkitt lymphoma, nasopharyngeal carcinoma, and AIDS-associated lymphoma. circRNAs were also detected in some KSHV infected primary effusion lymphoma cell lines and from some (but not all) Kaposi’s sarcomas. The contribution of these newly discovered viral circRNAs to tumorigenesis is unknown. One type of circRNA was found in all EBV-associated tumors examined, suggesting that at least for these cancers, they might have some role in tumor development or maintenance. Because circRNAs are very resistant to exonuclease degradation, they might be more useful than viral DNA detection for predicting disease. I wonder how many other DNA viruses encode circRNAs in their genomes, and what are their contributions to viral replication and pathogenesis. Previous post: TWiV 530: Quiet please!